This chapter will be flying in a holding pattern until I submit it after I get chapter 3 back in the next week or so. Until then, chapter 5, here I come. I’ve now written 126 pages, submitted 95 of those, and gotten 69 of them approved. DV, I’ll be finishing Chapter 4 this weekend and starting Chapter 5 next week. When I started my dissertation, I knew that it would be hard to keep myself productive and motivated on a year-long, self-planned schedule. What I didn’t realize until recently was that the key to keeping myself on that schedule was not to plan monthly deadlines, but to manage my hourly productivity each time I sat down to work. I’d sit down for an afternoon of research or writing, hit a block (obstacles are everywhere in a dissertation! ), and spend 2-3 hours chasing bad leads, looking for distraction, or just staring and waiting for inspiration. Apparently, even a 4 hour block of time is too long for me to be left unsupervised! Enter 30/30. 30/30 lets you create a list of tasks, sort them, assign them durations, and get notifications when it’s time to switch. It’s loosely based on the Pomodoro Technique, but it allows you to set any duration for any task. 30/30 helps me work by telling me what to do at this exact moment; it helps me avoid the seemingly endless Feedly breaks and focus on productivity, yet without letting the afternoon look like a long, boring block of time. Chapter 2 was a veritable beast to write. I’m glad to be finished with it. It’s been sent off to my volunteer readers and I’ll be editing and submitting it on Friday. Assuming that it is approved by my committee, that will bring my total page count to 68. I’ve also posted revisions to my deadline calendar. Originally, I left the summer entirely open, hoping to work ahead, catch up, or take some time off. Even though my committee won’t be obligated to return each chapter on a specific schedule, I’ll plan to complete a few more chapters during the summer and have a queue ready for the fall. Both my initial committee members have approved Chapter 1! Hopefully I can finish Chapter 2 within the next week or so. What a relief! I just submitted Chapter 1: “The Official Development of the Imperial Cult in Rome.” It ended up being almost 7500 words (10% of the minimum requirement). You know that feeling of starting a new project, having no idea how much time it’s going to take, but still needing to set some deadlines? Starting a dissertation fits that description precisely. It turns out, I didn’t finish chapter 1 in 3-4 weeks. I’m in my 5th week and not positive that I’ll finish this Friday. I’m not discouraged, however. A friend of mine who just finished his first draft last month told me that his first chapter took eight months to write. It’s not unusual for the first chapter to be more time-consuming. I’m certainly hoping that subsequent chapters move more quickly once more of the introductory research work is done. I’m flexible to make adjustments as I go. I’m not just adjusting due dates on a calendar; I’m also learning and adapting my work habits and schedule. I realize the importance of my dedicated study environment. I know now to request as many library loan books as soon as possible so I don’t get slowed down waiting for them. I can let writing time overflow into evenings and weekends if I need to. I can make up for lost time by writing this summer (I might not get immediate feedback but I can certainly have chapters ready when the school year begins). Here’s my revised calendar; here’s my progress meter. Thanks for checking them out and helping me keep going! After spending two days on a single book (a very detailed, very relevant single book! ), I decided to aim for momentum today. I’ve got another two volumes of two-day reading (and two or three more in the library loan shipping system), but before getting back into the “good stuff,” I knocked out several shorter, less pertinent sources this morning. It feels good to get through five books in one day. I know that Microsoft made Office a lot faster in the 2011 update, but they also took away the Toolbox. Since the Toolbox gives me the fastest access to styles & formatting (the key to a consistent dissertation layout!) that I’ve seen in any version of Word, I chose not to update yet. I’m aware that Word is not really a 300 page document application and will probably present some formatting problems down the road (pagination, TOC, embedded images & charts), but I’ve set up my own Turabian-compliant styles instead of relying on someone else’s template, so I expect to troubleshoot those concerns precisely. Once upon a time, I decided I would learn InDesign or LaTex, two programs that are much better for long document work, but I never did. So I’m using Word. Also, Word lets me access bibliography information in Zotero. Zotero is the best free way to manage a bibliography. It started as a Firefox extension. Mac users now get a standalone app with a Chrome plugin as well. 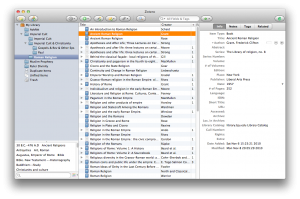 Zotero automatically identifies bibliography information on any web page: library listing, Amazon, JSTOR, etc. It adds an icon to your url bar that matches the resource type (book, article) and clicking that icon saves all the data available to a new item in the Zotero app. You can then fine-tune that bibliography data in the app (not all listings capitalize titles or format dates the same way), as well as add notes to the source. Best of all, it has an MS Word extension that allows you to insert footnotes, bibliography pages, and references from any resource you’ve saved to Zotero. All the data from Zotero is linked back to the database, so if you correct an error in a resource, you don’t have to search your entire dissertation for any reference to that resource; just refresh it. I mentioned that it does notes as well. 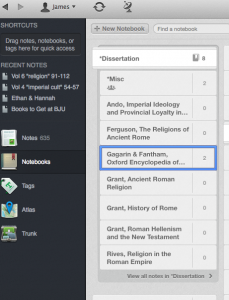 I chose not to use Zotero for notes, because Evernote has an awesome feature that Zotero doesn’t. Evernote is a note management software. I’ve long used it for classes, work, code snippets, project ideas, and recipes, so adding my dissertation wasn’t a huge deal. It has apps for just about any device you use, so it keeps my notes synced between all my computers, iPhone, iPad, and anywhere I use a browser. 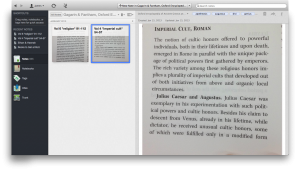 The feature that sets Evernote a mile above Zotero is its OCR feature. I can type quotations from sources into either Evernote or Zotero, but only Evernote lets me snap a picture of a page on my iPhone, then search the text in that image later. To organize all my notes, I’ve got a main folder called Dissertation. Then I create a sub-folder for each source. I put picture and typed notes into their proper folder. If I had very distinct chapter topics, I could also sort the resource folders into topic/chapter folders, but my chapters have more overlap. I’m going to use tags to organize individual notes. This will let me quickly find all my notes that refer to a single tagged topic instantly, no matter what book or article they’re in. Evernote is free to start. They offer a Premium version with some great features: 100mb uploads, increased monthly data limit from 60mb to 1gb, ability to search PDFs. I burned up my free 60mb in 2-3 days, so Evernote Premium is definitely worth it for me. You can get Premium for $5/mo or $45/yr. 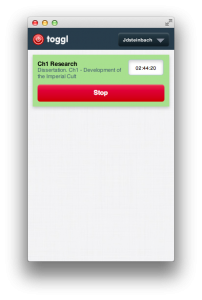 There’s nothing academic about Toggl, but I am tracking time spend on my dissertation. I use Toggl for work as well – it’s a simple, free web app with desktop / mobile apps available. At the end of this process, I’ll be able to look back and see exactly how many hours I’ve invested in it. I don’t know if that will impress or depress me, but time-tracking does help me keep moving. Knowing I’m “clocked in” goes a long way in the battle against procrastination and distraction.